1. 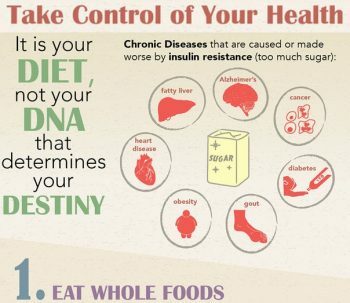 Find out how insulin resistant you are. Your health care provider can estimate where you are on the insulin resistance spectrum using simple blood tests such as glucose, insulin, triglyceride and HDL cholesterol levels, in combination with other information such as waist measurement and blood pressure. In my article How to Diagnose, Prevent and Treat Insulin Resistance, I include a downloadable PDF of tests with healthy target ranges for you to discuss with your health care provider, and a simple formula you can use to calculate your own insulin resistance. 2. Avoid refined carbohydrates like the plague, starting right now. Even if you don’t have insulin resistance yet, you remain at high risk for developing it until you kick refined carbohydrates such as bagels, juice boxes and granola bars to the curb.